Call it American innovation if you’re looking for a positive spin. Call it American hucksterism if you want to be a less positive. Peanut butter and jelly – slapping together two things that had never been put together before. It’s a combination you will rarely find anywhere outside America. Convenience stores with fast food chains inside them – nailing together things that hadn’t been nailed together before. Stop in and get gas, whatever that might mean to you. The smart phone is basically the result of taking a cell phone, and nailing lots of other things to it. I can’t wait until it’s also my garage door opener, my TV remote control, and an electric razor. Is there an ap for that? I don’t know what’s taking them so long. This country’s origins as a nation-state involved two kinds of Europeans coming over here. Pilgrims and puritans came here seeking a place to build the city of god. Then there were a lot of other Europeans that arrived on these shores because the British, French, and other colonial empires were using North America as a penal colony, often under the guise of indentured servitude. They were shipping their undesirables here. In the 18th-century, 50,000 British convicts were sent to colonial America. The two main strands that formed American culture were the churchy types who liked rules and the criminal types who really didn’t get along with rules. We’re a nation created from nailing together two very different things. When other religions began arriving here in notable numbers in the 20th-century, they, too, found themselves culturally nailed to things they had not been nailed to before. When Islam met the African American culture of the 1930s, the Nation of Islam was born. When a few Japanese Zen masters met the Beatnik and Hippie US culture of the 1960s, American Zen, culturally very different from Asian Zen, was born. And so on. Do Unitarian Universalists also nail together things that are generally regarded as very different? Boy, howdy! "Syncretism running completely amok," we've been called. How about these two: Punk rock and Islam. Surely those haven't been nailed together? They have! There have been Muslim Punk bands since at least 1979, in fact. Punk Islam turned into a movement with the 2003 novel, The Taqwacores by Michael Muhammad Knight. Michael Knight was born in 1977 in West Virginia, his father a Pentecostal and his mother Irish Catholic. When Michael was age 2, his mother took him and fled from Michael’s mentally ill and abusive father. Knight’s first exposure to Islam came when he was 13 and heard about Malcolm X in the lyrics of the hip-hop band, Public Enemy. He started reading more about Malcolm X, and about Islam, converted to Islam, and, at age 17, went to Pakistan to study Islam at Faisal Mosque. Now named Michael Muhammad Knight, he spent several years in Pakistan. 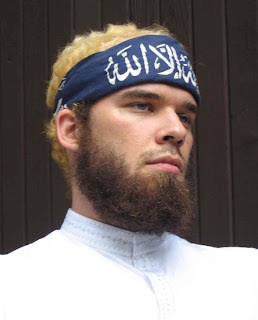 This is part 1 of 5 of "Punk Islam." Next: Part 2: "Yeah, But What Type of Punk Muslim?"